This otherworldly landscape looked like the setting for some sort of post-apocalyptic movie – Mad Max or suchlike. It is in fact a worked-out copper mine in Anglesey, North Wales. The place is a mixture of open-cast mines and deep shafts of the type more normally associated in the UK with coal mines. Men and children have toiled here for centuries, and there is still some copper to be extracted, apparently, but the difficulty of reaching it means that, for now, the task is not viable, and for the time being the place is silent. Not being an expert, I am not clear what all different the colours represent. 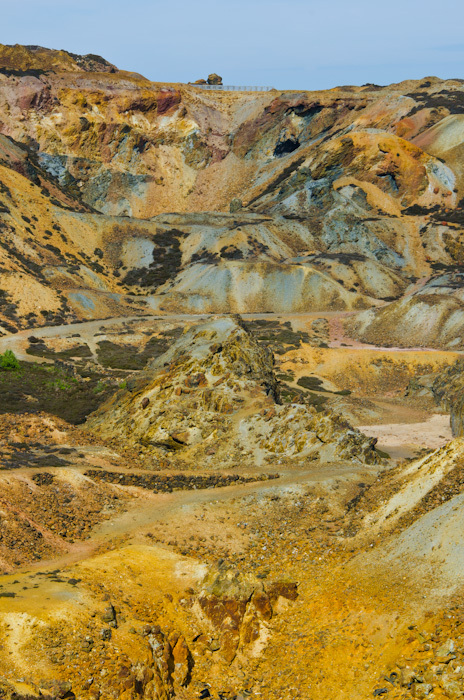 Some are no doubt the natural colours of rocks dug out to access the copper; other colours have evidently been impregnated into the rocks during heat treatment and processing. Maybe chemicals were used in the processing. Whatever the case, the area gives a clear sense of having been poisoned. The occasional puddles you see are unnaturally bright greens and yellows; there is little plant life, just some fairly sparse heather with peculiar blue-grey stems; and the place is completely devoid of birds.